Click here for the Goods & Services Register. The Rifle Butts Wind Farm is located some 20km south west of Horsham in Victoria. It is planned with a capacity of up to 13 wind turbines producing up to 40MW of renewable energy. 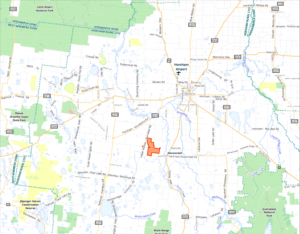 The wind farm is located approximated 4km west of Wonwondah North, VIC 3401. It is situated to the north of Rifle Butts Road, east of Sandy Creek and to the south of Rifle Butts Road, west of OConnors Lane. Estimated thirteen (13) wind turbines with a capacity of 3MW each = 40MW total capacity. Towers expected to be up to 150m in height, total height being up to 235m (to the top of the blade). The Wind Farm will connect into the 66kV distribution line at the corner of Wonwondah-Toolondo Road and Motts Road. Various studies and models have been completed in discussion with Powercor and AEMO, working toward a Grid Connection Offer. NewEn has been conducting wind measurements via a LIDAR unit since January 2017. After the initial results were successful a met mast of 85m in height was installed in September 2017 for more accurate wind measurement. A public meeting was held on 9th November 2016 to inform the local community of the proposed wind farm. Read the article from the Horsham Weekly Advertiser. A further public meeting was held on 16th January 2018 at the local Wonwondah Hall to inform the local community of the development application process. A Planning Permit Application was lodged on 22 December 2017 with DELWP. On 27 June 2018 the Planning Permit was issued by the Minister for Planning. A Grid Connection Offer from Powercor is expected by March 2019. Construction of the wind farm is expected to start by early 2020. Companies and individuals are invited to add their details to the goods & services register for the Rifle Butts Wind Farm project. A locality map shows houses within 5km of the wind farm site. The map can be viewed by clicking here.